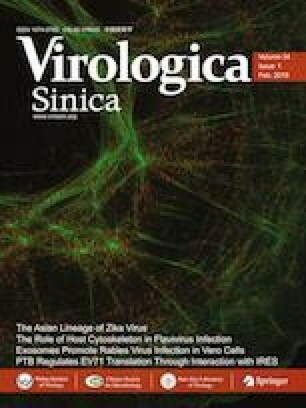 Tick-borne encephalitis virus (TBEV) belongs to the genus Flavivirus within the family Flaviviridae and includes three subtypes: Siberian, European, and Far Eastern. TBEV infects humans via tick bites; indeed, at least 10,000 human cases of encephalitis caused by TBEV are reported annually in Russia, China, and European countries (Banzhoff et al. 2008; Carletti et al. 2017). In China, the main subtype of TBEV is Far Eastern (Zhang et al. 2016).This subtype spread across the forest region of northeast and northwest China, with thousands of people infected annually. TBEV mainly causes severe meningitis and encephalitis. The symptoms include fever, headache, neurological disorders, and/or peripheral flaccid paralysis (Mansfield et al. 2009). Early diagnosis is crucial for the control and treatment of TBEV infection. Jia Jia and Yuchang Li have contributed equally to this work. The online version of this article ( https://doi.org/10.1007/s12250-019-00105-4) contains supplementary material, which is available to authorized users. This work was supported by the National Major Science Program Foundation (Nos. 2018ZX10711001-003, 2018ZX10302401-008 and 2017ZX10305501-010), the Major Special Program Foundation (No. AWS15J006), and the National China Science Foundation (No. 81501789). This study was approved by the ethics committee of Beijing Institute of Microbiology and Epidemiology. Informed consent was obtained from all of the patients whose sera or CSF samples were used in this study.